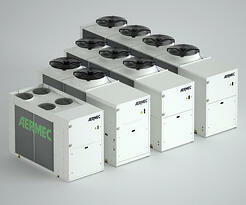 Aermec presents the NRBH small-medium power range to complement the NRB cooling-only version. The NRBH meets the the Climate and Energy Package which are the set of measures that the European Union has drawn up with the aim of reaching the goal of a 20% cut in greenhouse gas emissions by 2020. The unit is ideal for air conditioning in residential, commercial, or industrial applications. NRBH is designed to guarantee high efficiency not only with a full load but also with partial loads. Every design need is fully covered by the cooling capacity range from 16 to 59 Tons and heating capacity from 197,904 to 651,719 Btu/h. The unit is available in 15 sizes. NRBH is available in single-circuit and dual circuit versions. The NRBH is fitted with SEER optimized scroll compressors, the latest plate heat exchangers optimized to work at high evaporation temperatures and with a partial load, and finned coils with a reduced tube diameter. Installation is possible in areas with limited space, as high static pressure fans can be assembled. This allows the ducting of the condensation air. There is also an integrated hydronic kit that comes with storage tank or pumps. All the NRBH versions offer Night Silent Mode for quiet night-time operation. It guarantees greater acoustic comfort especially during night hours whilst still maintaining high efficiency levels.